Discover New PURINA PRO PLAN NutriSavour. 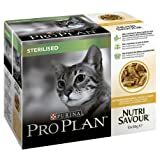 A complete and balanced wet cat food that combines the exceptional nutrition you want with a variety of protein-rich tender chunks and delicious gravy that your cat will love. INGREDIENTS Meat and animal derivatives (of which chicken 4%), vegetable protein extracts, fish and fish derivatives, derivatives of vegetable origin, minerals, oils and fats, various sugars. ANALYTICAL CONTENT Protein: 13.0%; Fat content: 3.3%; Crude Ash: 2.0%; Crude Fibres: 0.5%; Moisture: 78.0% FEEDING GUIDE For an average adult cat (4kg), feed 3 pouches per day in at least 2 separate meals. The adult maintenance averages are based on moderately active cats at normal environmental temperatures. Individual needs vary and feeding should be adjusted as required to maintain your cat at a lean, healthy body weight. Serve at room temperature.Fresh, clean drinking water should always be available. This entry was posted in Uncategorized and tagged Chicken, Plan, Sterilised by One Boutique. Bookmark the permalink.